Facebook today made it possible to share GIFs within comment threads on posts. 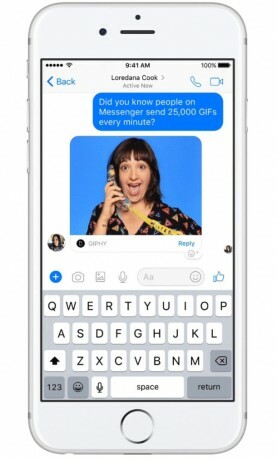 Facebook Messenger has supported GIFs for some time; in fact, people share 25,000 GIFs in Messenger every minute, totaling some 13 billion GIFs in 2016. Now, people will be able to add GIFs as reactions to posts and other comments. A dedicated GIF button has been added to the tool for composing comments. Users need only search for the GIF they want and insert into a comment thread. In order to celebrate the addition of GIFs to comments (and the 30th anniversary of the GIF), Facebook partnered with GIPHY Studios to create 20 new GIFs from a selection of celebrities, such as DNCE, Logan Paul, Amanda Cerny, Dreezy, Patrick Starr, Violet Benson, Wuz Good, Brandi Marie, and Landon Moss. The expanded support for GIFs is rolling out today for all Facebook users worldwide. Facebook today announced several new features for Messenger that should make the messaging application even more interactive. First, the app adds the ability to react to messages in one-on-one or group chats. Instagram today introduced two tools it hopes will help reduce toxic and spammy comments on users' posts. First, Instagram is adding a filter to block offensive comments that might be made on posts and videos.